International touring sensation Black Violin will be bringing their unique genre-breaking brand of music to Husson University’s Gracie Theatre on Thursday, April 4, 2019 at 7:30 p.m. as part of their 2019 Impossible Tour. Led by classically trained string players Wil B. (viola) and Kev Marcus (violin), Black Violin has created their own unique sound through a daring combination of hip-hop, rhythm and blues, bluegrass and classical music. Joining Wil B. and Kev Marcus onstage are DJ SPS and drummer Nat Stokes. The band uses their unique blend of classical and hip-hop music to overcome stereotypes while encouraging people of all ages, races, and economic backgrounds to join together and break down cultural barriers. In the past 12 months, these musicians have performed for over 100,000 students in the US and Europe, and collaborated with Yamaha and NAMM (National Association of Music Manufactures) to continue supporting music education. Creative collaborations other talented artists include Kanye West, the Wu-Tang Clan, Wyclef Jean, Lil Wayne, and Alicia Keys. 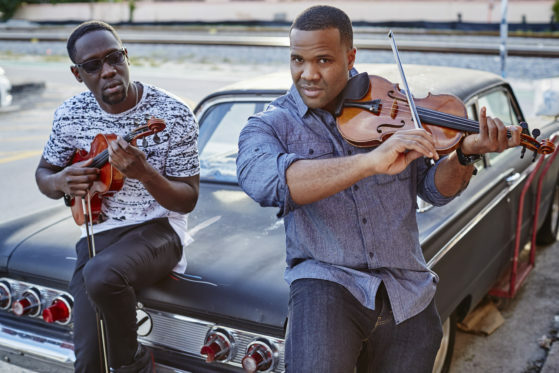 In 2016, Black Violin composed music for FOX’s hit TV series Pitch and the group has made appearances on HBO’s Ballers, The Tonight Show, The Wendy Williams Show, The Ellen Show and the 2016 Heisman Trophy Presentation on ESPN. When they’re not performing, this musical sensation advocates for educational outreach. They were the Turnaround Artists for the Mary B. Bethune Elementary School in their hometown of Broward County, Florida. Turnaround Arts, a national education program affiliated with the John F. Kennedy Center for the Performing Arts, infuses arts into struggling schools to support overall reform efforts. Founded by President Obama’s Committee on the Arts and the Humanities in 2012, the program connects schools with musical instrument grants, arts supplies, and professional development. As part of the process, Turnaround Arts pairs each school with an artist who provides mentorship, inspiration, and support during the program. Many notable musical performers have participated in this initiative. Artists like Elton John, Edward Norton, and Yo-Yo Ma, as well as many other highly acclaimed members of the arts community, have lent their expertise to struggling schools. Additionally, Black Violin continues to perform for more than 100,000 students annually throughout North America and Europe. To learn more about Black Violin, visit their website at http://blackviolin.net. Tickets for Black Violin range from $37.00-$49.50. Group discounts are available for groups of 12 or more. Husson University staff and faculty can purchase tickets at a special BOGO (buy one, get one) rate. Faculty and staff can purchase tickets at this rate online using the promo code VIOLIN or in person at the Gracie Box Office. To purchase tickets or for more information about group rates, call the Gracie Box Office at (207) 941-7888 or visit www.gracietheatre.com. The Gracie Theatre is located at One College Circle in Bangor, Maine. The Gracie’s season is made possible with support from Bangor Savings Bank. The theatre also gratefully acknowledges the generous support provided throughout the season by additional show sponsors including Downeast Toyota, Pepsi and The Dead River Company. Completed in October of 2009, The Gracie is Husson University's center for the fine and performing arts. This beautiful 500-seat theatre is considered one of Maine’s premier performance venues. In addition, The Gracie also serves as a learning platform for students from Husson University’s New England School of Communications in digital audio; sound mixing; set design and construction; lighting; acting and electronics.